ASTANA – Horyou, an action oriented social network for social good, organised the Social Innovation and Global Ethics Forum (SIGEF) Sept. 5 to discuss future energy, smart cities and the UN Sustainable Development Goals (SDGs) and lead an official delegation to EXPO 2017. International speakers, panellists and moderators attended the event. “With SIGEF, Horyou is committed to encouraging multi-stakeholders to gather, interact and establish partnerships to shape better times to come. SIGEF will bring together social entrepreneurs, impact investors, philanthropists, government officials and representatives from civil society to spread the message that we can all be changemakers,” said Horyou founder and CEO Yonathan Parienti. Participants discussed the challenges of climate change amid economic development and urban growth. UNDP Deputy Resident Representative for Programme and Operations Munkhtuya Altangerel focused on low carbon urban development in Kazakhstan. “Cities represent entire systems or I can even say ecosystems. If we are to build smart and sustainable cities, we need to think how we bring more sustainability into every part of urban infrastructure. After having tried and tested demonstration projects promoting greater energy efficiency across Kazakhstan, we are now working to reduce carbon intensity in a series of Kazakh cities,” he noted. Parienti added it is important that the sustainability agenda is driven by youth, children and all citizens of Kazakhstan. Reinforcing its global presence and impact, Horyou organised the first SIGEF this year in Central Asia, with an agenda of discussions deeply anchored in the future of interconnected societies, according to horyou.com. Horyou and the SIGEF team plan to visit the expo country pavilions Sept. 6-7, the biggest future energy gathering this year. 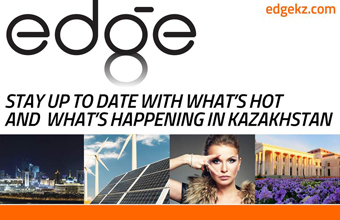 “We are thrilled to bring our SIGEF international delegations to connect with participants from all continents who are attending EXPO 2017 Astana, to build bridges of collaboration and foster sustainable solutions that will benefit our societies,” said Parienti. Through technology, innovation and social entrepreneurship advocacy, Horyou promotes meaningful and global interactions amongst its adherent organisations, members and personalities. With its platform, app and Spotlight, the first Global Social Currency for Impact, it helps transform positive ideas into concrete actions while building constructive relationships both online and offline. The Horyou community embraces more than 1,000 organisations and 220,000 users from more than 180 countries.